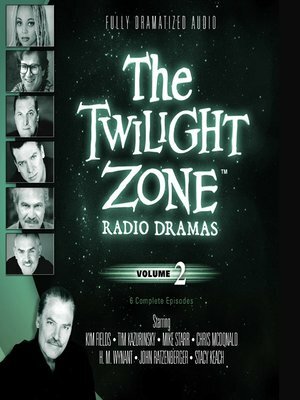 Experience one of television's greatest science fiction series: The Twilight Zone. This collection of episodes is fully dramatized for audio and features a full cast, music, sound effects, and narration by some of today's biggest celebrities. A young woman goes gift shopping at a department store and buys a thimble. When the store closes, she is trapped on the ninth floor—even though no such floor exists. A timid vacuum cleaner salesman is given super strength in a Martian experiment. He eventually returns to normal—at least for a brief time. A man convicted of murder is sentenced to spend forty years on a distant asteroid in complete solitude—that is, until a sympathetic ship captain brings him a female robot companion. Jared Garrity makes a living resurrecting the dead in the Old West. He doesn't make money from those who want people brought back to life but from those who want the dead to stay just where they are: six feet under. William Feathersmith, a bored, evil, wealthy businessman, gets a chance to go back in time and start over, armed with all the knowledge he's acquired—an arsenal that's not as powerful as he might think. Julius Moomer is an untalented would-be television writer whose career takes off when the ghost of William Shakespeare writes his scripts for him. Shakespeare is appalled by the sponsor's changes, including the casting of a Marlon Brando–type actor to play the lead.